NOTE: This class belongs to my Family History series, register for all three at a discount! We all own envelopes, albums, or even boxes of photos, negatives or slides from the even before 1900, all the way through the 40s, the 60s, the 80s, and in between! Often these photos have been the victims of poor storage, fading, color shift, stains, tears, scratches, dust, and the simple aging process. In this self-paced, video-based course, I'll walk you through the techniques for restoring your vintage photos to their former glory - and beyond! Some of my most precious personal memories are from Christmas and other holidays when I was little, as well as family vacations. Since I was born in the 70s, I have some truly awesome examples of 70s clothing. My parents have great examples of photos from the 60s, and I've inherited lots of 30s, 40s, and 50s black and whites, as well as some great sepia-tone photos from the turn of the century. I LOVE these pictures. They're part of me, because they're my family. My people. I recognize myself in their features, and I'm so grateful for the connection these photos provide for me. I'm especially excited for this particular class, because I am looking forward to sharing the techniques that I've used to restore my precious vintage photographs to their former glory, and beyond! Join me in class as we swap stories, share gorgeous photos and memories, and work to bring the lives of our ancestors back into focus with Photoshop! You can use either Photoshop Elements 13-14, OR Photoshop CC for class. This video-based course focuses on photo restoration - things you can do to bring older photos back to life, losing some of the grainy, faded appearance. You'll learn the basic photo editing workflow I use for older photos, plus extra techniques to take them to the next level! You'll take photos through simple transformations that will have you (and your loved ones) saying WOW! You'll love what an incredible difference you can make to your own precious photos. There's nothing like the rush! I swear! There's no going back in time to re-shoot some of our most precious photographs, as damaged as they may be by age, exposure, or poor storage. But with the techniques you'll learn in this class, you can restore your vintage snapshots to their beautiful best. I can't wait to show you! By the end of class, you will have learned new Photoshop techniques to touch up and restore your vintage photos! How awesome is that? We love to see your photos and cherished albums, and with every JessicaSprague.com course, there are many different ways to get in touch to show off your art, or ask a question! Register now, and I'll see you in class! Hi there! 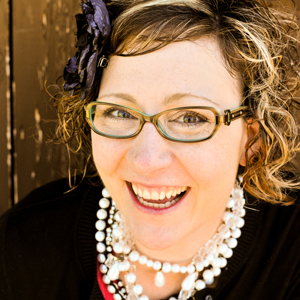 I'm Jessica Sprague, owner and instructor here at JessicaSprague.com. 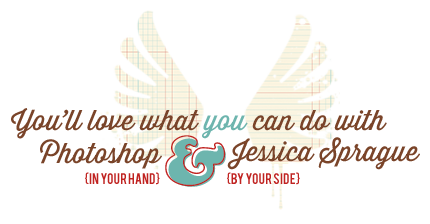 I founded JessicaSprague.com in 2007 to share the creative potential of Photoshop for crafting. I've been teaching Photoshop and graphic design, photo editing, digital scrapbooking, e-commerce, and online school development for a decade. It's my goal to help you build the skills and knowledge that will last you a lifetime. Learn more about me. Are you ready to start the journey? Join me! The course begins RIGHT NOW and never ends! It is a completely self-paced online course - you decide when you start and when you finish. Does this course require Photoshop skills? This course is great for beginners through advanced Photoshop users! All of the classes here at JessicaSprague.com come with gorgeous video instruction, broken down into project-based lessons and individual tasks within each lesson. This bite-sized approach to Lightroom and Photoshop makes it easy to understand, and you'll be amazed at what you can accomplish in just 30 minutes at a time! In addition to the lesson projects, I'll offer challenges, extra information, links, downloads, and other materials designed to enhance your experience and deepen your understanding of how to use Photoshop in your specific area of learning. You'll take the class completely at your own pace (you never need to be online at a specific time), and all of the course materials are available to you FOREVER from your My Classes page here at JessicaSprague.com. We love users of Mac or Windows, and welcome students from around the world to join us! In addition to the classroom, which contains video-based lessons and downloadable PDF companion guides to help you follow along, our class also features a private forum where you can ask and answer questions and participate in discussions, as well as share your beautiful work with me and the other students! Founded in June 2007, JessicaSprague.com is the home of the world's best online classes and products for digital crafters. Learn more about Jessica. Photoshop* and Photoshop Elements* are registered trademarks of Adobe Systems Inc. All rights reserved.